Home - News - Gallery - Management Plan - Projects - Introduction. Since the release of the Ord Land and Water Plan in October of 2000 Ord Land and Water has been active in implementing the strategies and actions of the Plan by building projects in partnership with other organisations or on its own. 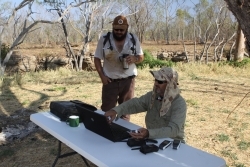 The projects are managed by a full time coordinator and have been funded by various funding initiatives including Federal and State Government NRM programs such as the Natural Heritage Trust, the National Action Plan for Salinity and Water Quality, Caring for Our Country, State NRM and Department of Parks and Wildlife. Funding has also come from Lotterywest and the Shire of Wyndhasm East Kimberely for a number of small projects. Currenty the organisation has prioritised weeds, fire and surface water quality as focus areas for projects.